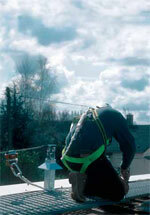 The Söll Xenon Horizontal lifeline system is the ideal solution for protecting workers at height. The dual protection design of the Xenon system allows workers to be restrained from reaching a point where a potential fall hazard exists and also provides fall arrest protection in the event of a fall. It's functional design was developed to allow increased freedom of movement at any angle and it is adapted to any style of work at height, be it in a straight line or installations around corners and bends. Due to its versatility, simplicity and minimal maintenance, the Xenon Horizontal Lifeline is the perfect tool for engineers, contractors and architects to provide secure access on new and existing buildings. The Söll Xenon Horizontal Lifeline Shuttle represents a revolutionary design with many innovative benefits. Improved safety with a double locking mechanism. User can connect and disconnect easily anywhere along the cable. Ergonomically designed, the oversized handle allows the use of any type of certified connector. Resistance to the environment - made of stainless steel with few moving parts, it is ideal for sandy, gritty or salty environments. The intermediate bracket and corner units allow the shuttle to glide smoothly and easily over the connection. Provides an easy passage of the shuttle through the hangers. Designed to retain and transfer its load after a sustained fall. The bracket can be replaced without cutting the cable. Stainless steel end anchors and swages allow easy installation of the system without compromising cable strength and integrity. End swages available with and without integrated tensioner. Designed to accommodate a number of different swaging methods. 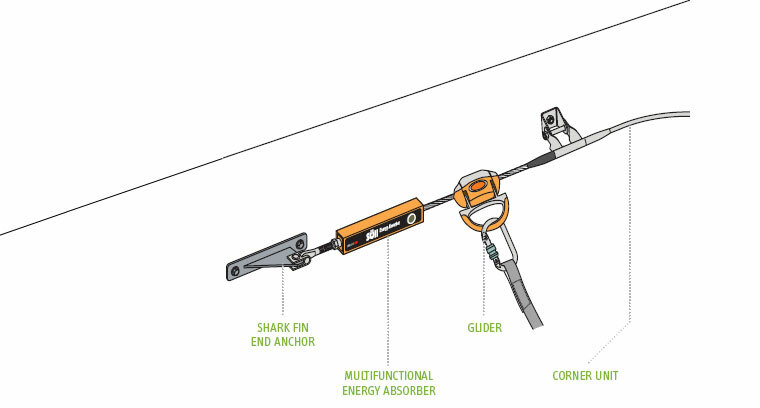 A revolutionary "four-in-one" shock absorber, tensioning device, tension indicator and fall indicator. The shock absorber reduces the load impact generated by a fall. Protects the user as well as the supporting structure. Integrated load indicator provides a visual indication, alerting the user to any load impact on the system. Easier installation and maintenance - a single element allows you to both verify and adjust the tension easily.